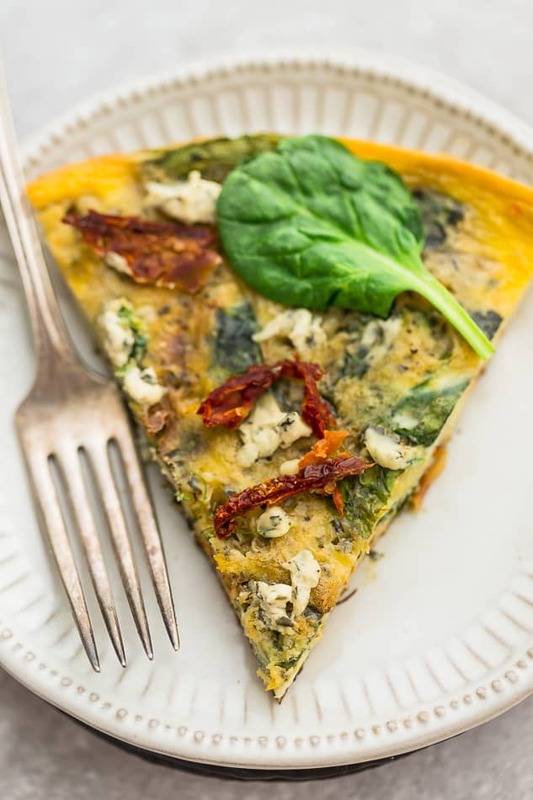 This Spinach Frittata is an easy low carb recipe perfect for a spring breakfast, Easter brunch or dinner. It’s gluten free, keto friendly and made with spinach, broccoli and sun-dried tomatoes. ggs for breakfast happen a lot around here. We usually rotate between these breakfast egg muffins, egg casserole, hard boiled eggs, baked eggs and frittatas. 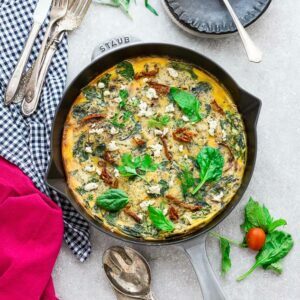 This spinach frittata with sun-dried tomatoes is easy to make and includes tons of healthy vegetables like broccoli, onions and sun-dried tomatoes. It’s simple to customize with any add-in and filling choices you like and have on hand. If you’re not a fan of feta or want to make a dairy free frittata that is paleo and Whole30 compliant, simply leave out the cheese. 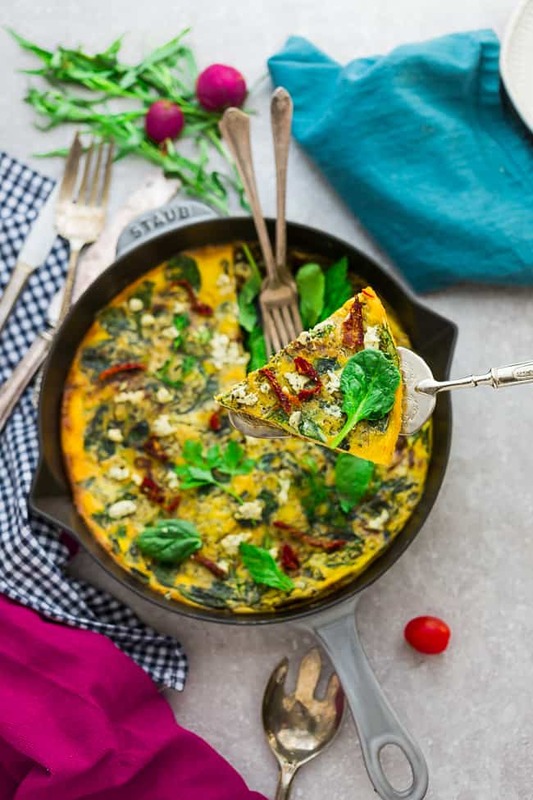 Another great thing about this spinach frittata recipe is that you can make it ahead the night before when you have overnight guests for Mother’s Day, Easter or any weekend brunch. 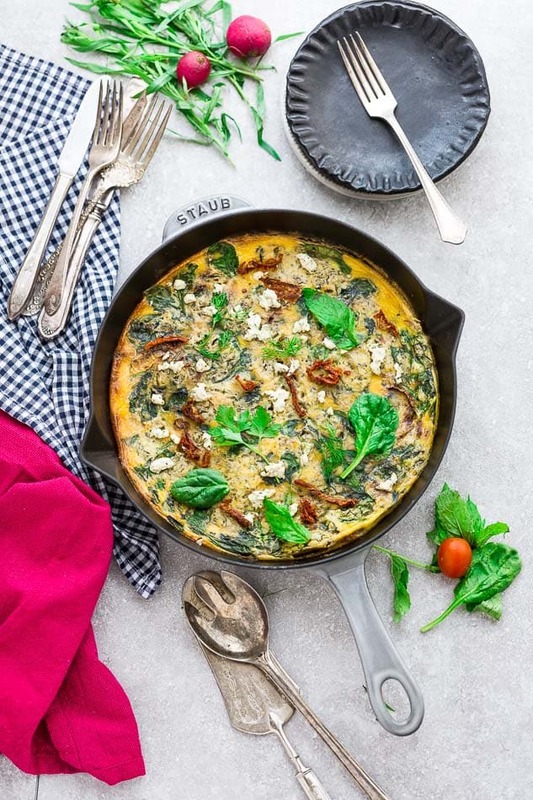 This stovetop frittata also makes an easy, quick and delicious meal and is perfect for busy mornings. Ever have that craving for eggs for breakfast but want something more filling than a scrambled egg or a poached egg? Omelettes and frittatas are the perfect easy breakfast option. Omelettes are typically made to serve just one, while frittatas can serve one or many. WHAT IS A FRITTATA MADE OF? A frittata is an egg-based Italian dish that is made with well-beaten eggs. It’s similar to an omelette or crustless quiche except you cook any additional filling ingredients directly in the pan with the eggs. Frittatas are a great way to use up leftover ingredients such as meats, cheeses or vegetables. HOW DO YOU MAKE A BASIC FRITTATA? 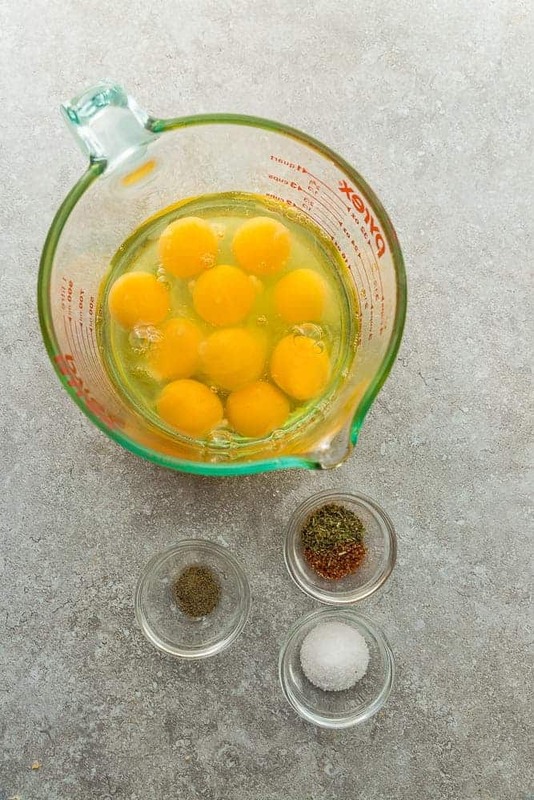 To make a vegetable frittata, you start by beating the eggs and cooking them in a hot skillet for a few minutes until the outer edges are set. Add the filling ingredients and transfer the pan to the oven where the eggs finish cooking. HOW DO YOU GET A FRITTATA OUT OF THE PAN? Once you add the beaten eggs to the pan, be sure to allow them to cook undisturbed, until the eggs have set. The top layer will be uncooked so you’re going to place the entire pan under a broiler, until the top is brown and puffy. Put on some oven mitts and carefully take the hot pan from the oven and allow the frittata to cool slightly in the pan. Cut into slices and use a spatula to loosen the frittata along the sides. Start off by heating some oil or butter in your cast iron skillet or oven safe frying pan over medium high heat. Add the onion, broccoli and sun-dried tomatoes. Saute for 2-3 minutes. Meanwhile, whisk the eggs with heavy cream and add the spinach. Season with salt, black pepper and garlic powder. Pour egg mixture into the skillet over the vegetables and sprinkle with feta cheese. Transfer the frittata into the oven until just set. WHAT OTHER FILLING INGREDIENTS CAN I ADD TO FRITTATAS? The great thing about frittatas is that they are perfect for using up leftover vegetables and protein from your fridge. 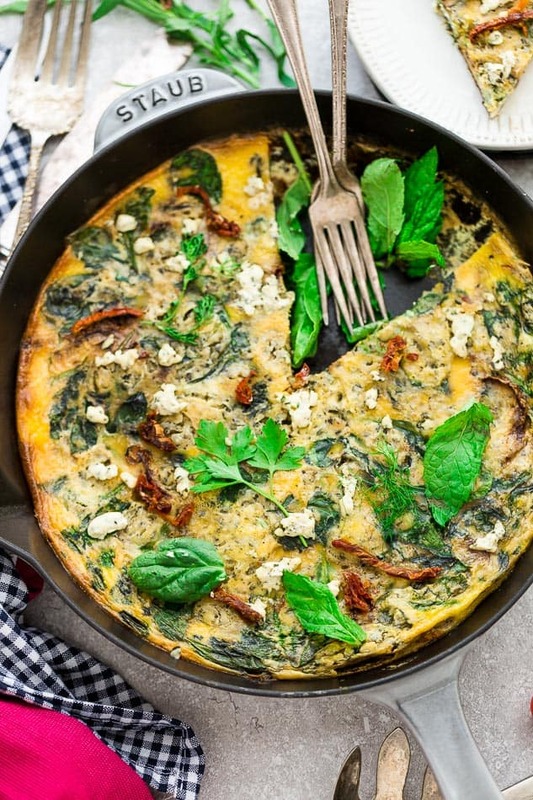 Add some zucchini, or kale to keep this frittata low carb. If you want to add some protein, feel free to add some leftover ham, bacon, prosciutto, sausage, cooked chicken or turkey. Not a fan of goat cheese? Leave it out or use feta instead. HOW DO I STORE FRITTATA? CAN I MAKE FRITTATAS AHEAD OF TIME? Yes, frittatas are a delicious freezer-friendly meal. You can cut into wedges and wrap each individual piece in the freezer and reheat when ready to serve. WHAT SHOULD I SERVE WITH FRITTATAS? While frittatas are delicious on their own for breakfast, you can also serve them with sides for a quick breakfast for dinner (we love brinner) on those busy weeknights. This Instant Pot Ham, pot roast, roasted asparagus or this delicious salmon cobb salad would be great options. 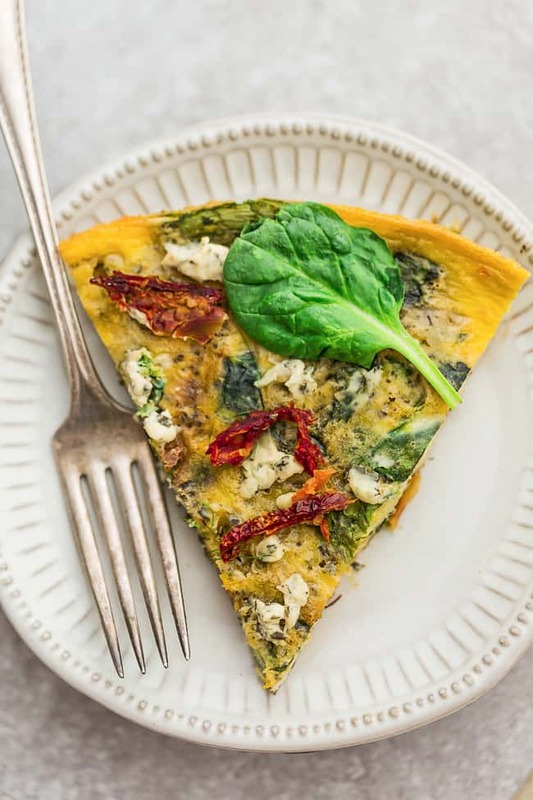 This Spinach Frittata is an easy low carb recipe perfect for a spring breakfast, brunch or dinner. It's gluten free and made with spinach, broccoli, sun-dried tomatoes and goat cheese. Preheat oven to 400 F degrees with the rack in the middle position. In a 10″ nonstick skillet over medium heat, heat the oil or butter and add the onions, broccoli and sun-dried tomatoes. Cook for 2-3 minutes, until just becoming tender. Season with a pinch of salt and pepper. Meanwhile, whisk the eggs with cream and season with additional salt and pepper. Stir in the garlic powder and spinach. Pour the eggs into the same pan, and top with crumbled goat cheese. Transfer the pan to the oven and cook until the the frittata is just set, about 15-18 minutes.